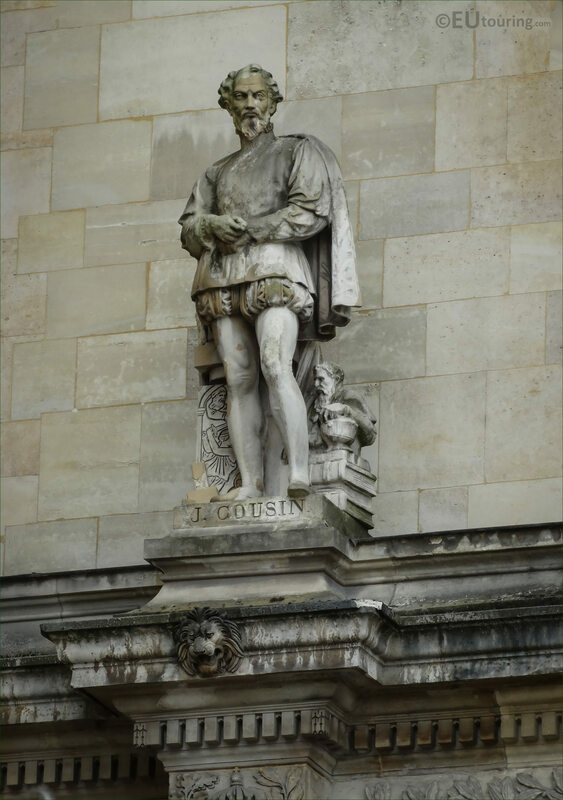 This time while were visiting the famous tourist attraction in Paris of the Musee du Louvre located in the 1st Arrondissement, when we took these high definition photos showing the statue of Jean Cousin, sculpted by Theodore Jacques. 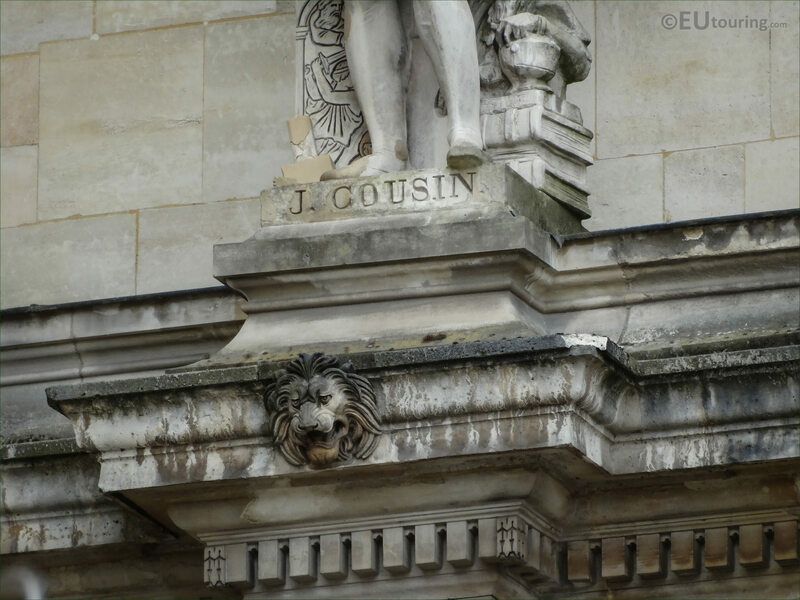 So this first HD photo shows the full stone statue of Cousin, which is located on the Rotonde d'Appolon wing of the former Palais du Louvre, and as you are looking at the facade from the Cour Napoleon courtyard, this is positioned on the first level right next to where the building returns from the Aile Henri II. And this was produced by Theodore Joseph Napoleon Jacques, who was born on 12th May 1804 in Paris and is often referred to as just Napoleon Jacques, and he became a French sculptor. Yet not much is known about his career, although he did spend several years in Russia prior to returning to France. Now this last close up high definition image shows the base of the stone statue, which as you can tell states J Cousin, yet we have not been able to determine whether this was Jean Cousin the elder, or his son, as both of them were French painters, etchers and engravers. 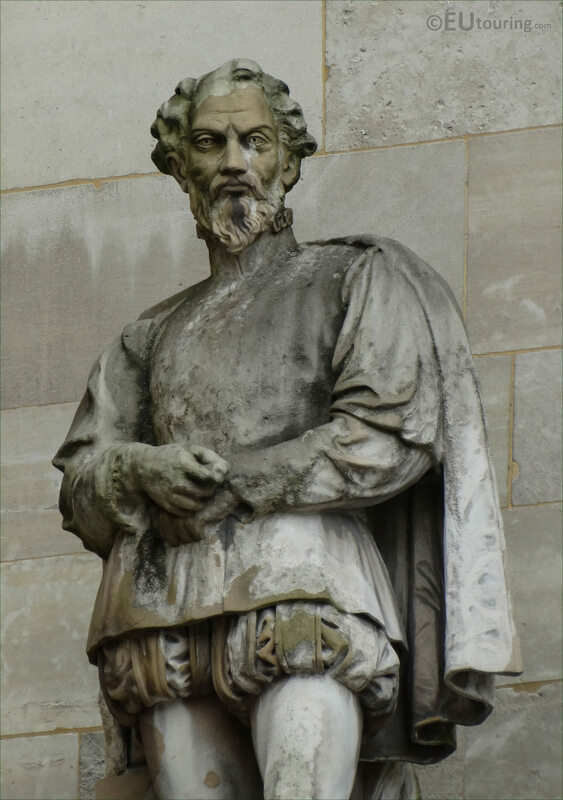 In addition to this, they were both born in or near Sens, and their deaths were both in the 1500s, plus their works are very hard to distinguish between the two, although by the legs of this statue, there appears to be a part of the sculpture depicting a window, and Jean Cousin the Elder worked on painting windows for many different chateaux and churches.